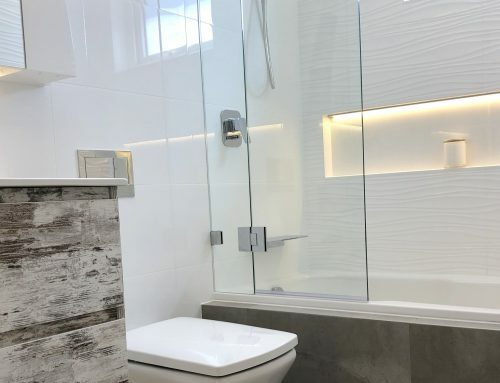 This gorgeous ensuite bathroom renovation we completed in Thornleigh is proof that bathrooms do not have to be big to be beautiful. 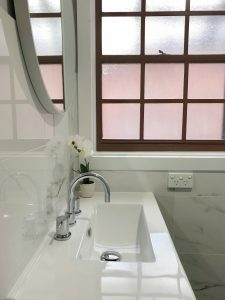 Gorgeous faux marble tiles with timber wall hung vanity and round mirror – bathroom renovation by Master Bathrooms & Kitchens. 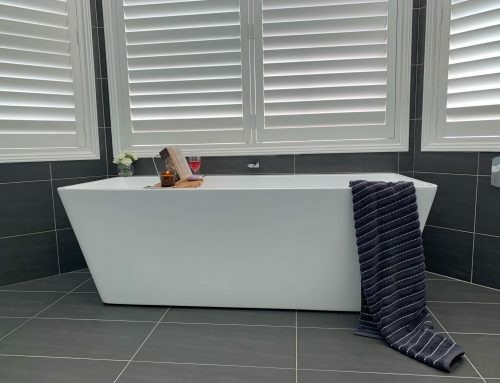 Our customers chose tiles and items that combine the natural elements of timber and marble, creating a beautiful bathroom space that has an abundance of light and is a pleasure to be in. 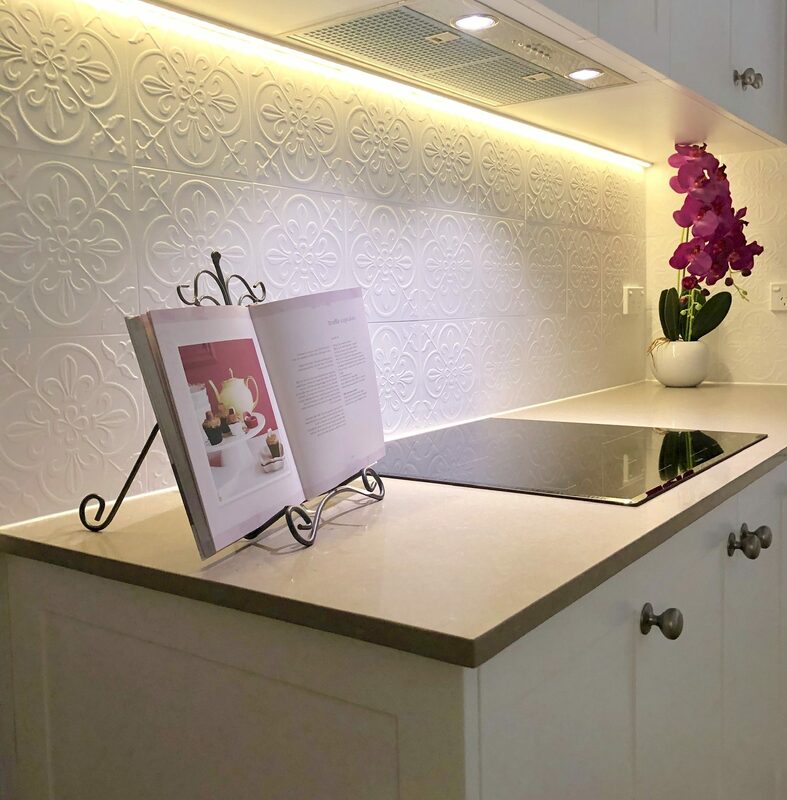 The walls are tiled in a gorgeous faux marble 300 x 600mm gloss tile and the floors are in a darker neutral coloured 300 x 300mm satin tile. 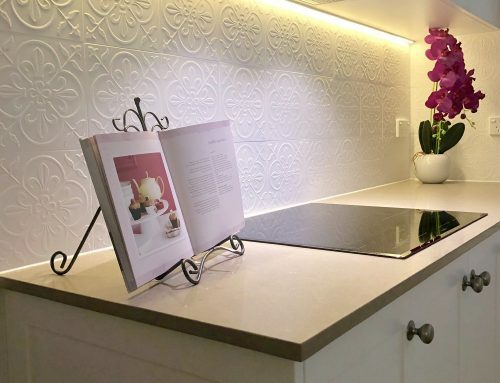 These tiles exhibit the beauty of marble, with all its veining, without the price tag or the extra maintenance. 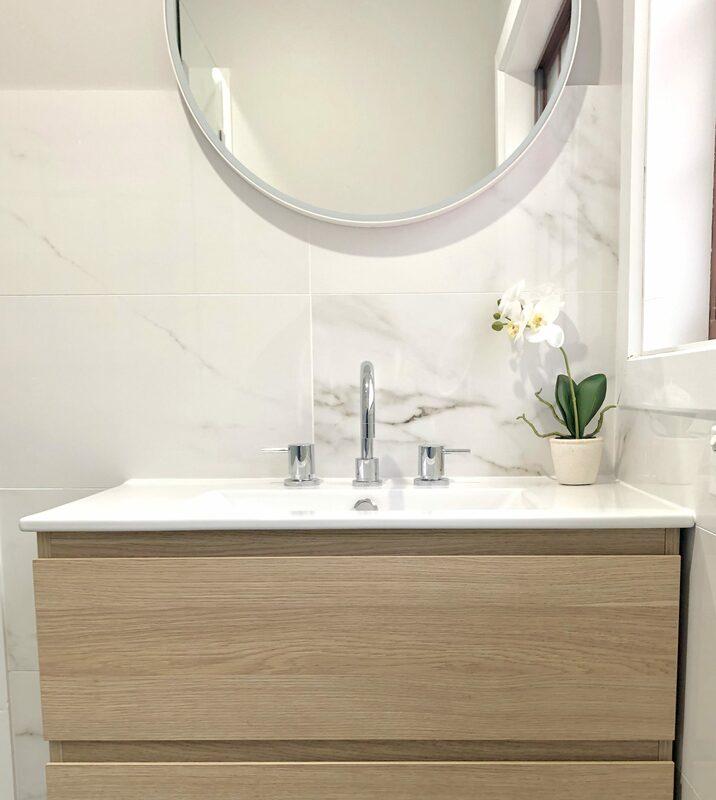 The vanity is a timber wall hung vanity with 2 deep drawers that allow easy access to stored toiletries. 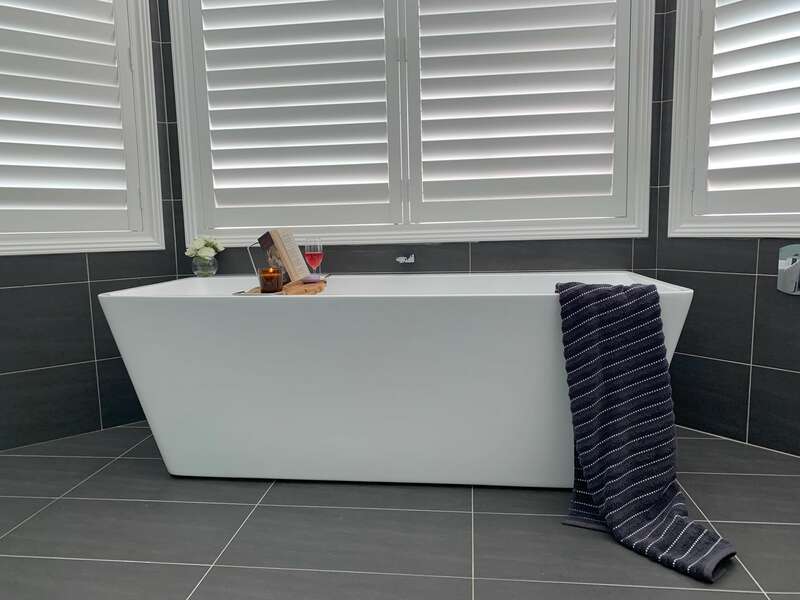 It is complimented by a 3 piece chrome arched tap set and a gorgeous round mirror that works perfectly with the sash window. Round mirrors are quite popular as they create character in the bathroom, providing that finishing touch. 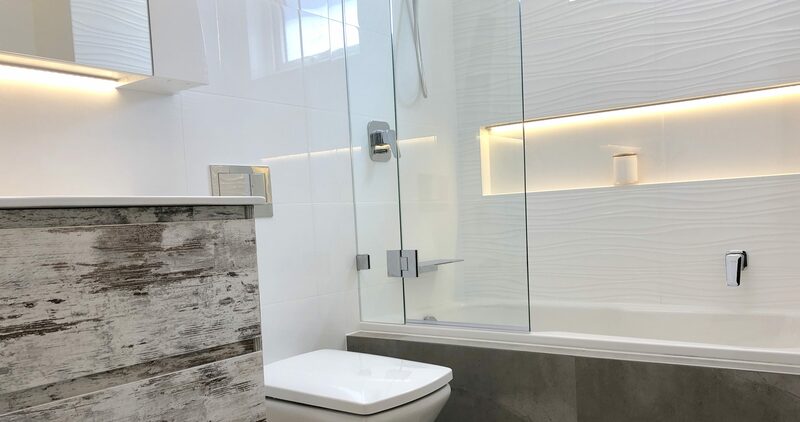 Natural elements blending perfectly – bathroom renovation by Master Bathrooms & Kitchens. 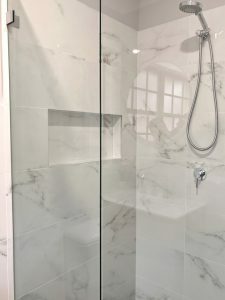 Corner shower recess with hand held shower rose, mixer, niche and frameless shower screen – bathroom renovation by Master Bathrooms & Kitchens. 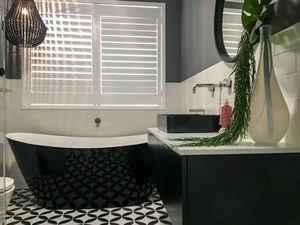 P Trap enclosure created to hide ugly plumbing – bathroom renovation by Master Bathrooms & Kitchens. 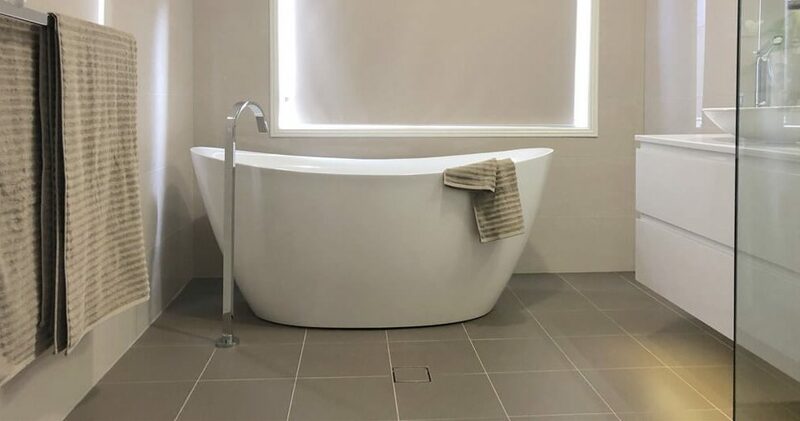 Stunning faux marble 300 x 600mm porcelain tile – bathroom renovation by Master Bathrooms & Kitchens. 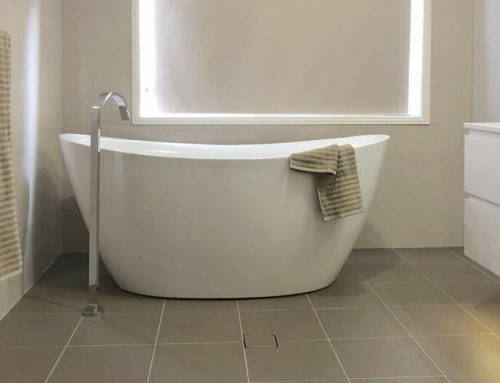 The corner shower recess provides plenty of room to move without crowding the room and features a chrome hand held shower rose with massage settings, a sleek chrome mixer, shower niche that keeps toiletries off the floor and a beautiful frameless shower screen. The toilet had a P trap configuration. 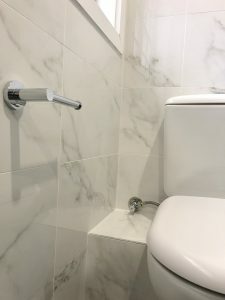 These types of toilets have the plumbing through the wall which can create an eyesore. To avoid this, we built an enclosure which was tiled to hide the plumbing. This enclosure blends in perfectly with the walls and can be used as a shelf if desired. All accessories are in chrome to match the chrome tapware. 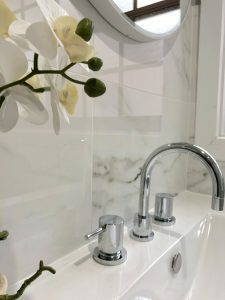 Master Bathrooms & Kitchens is a bathroom and kitchen renovation company that is family owned and operated. 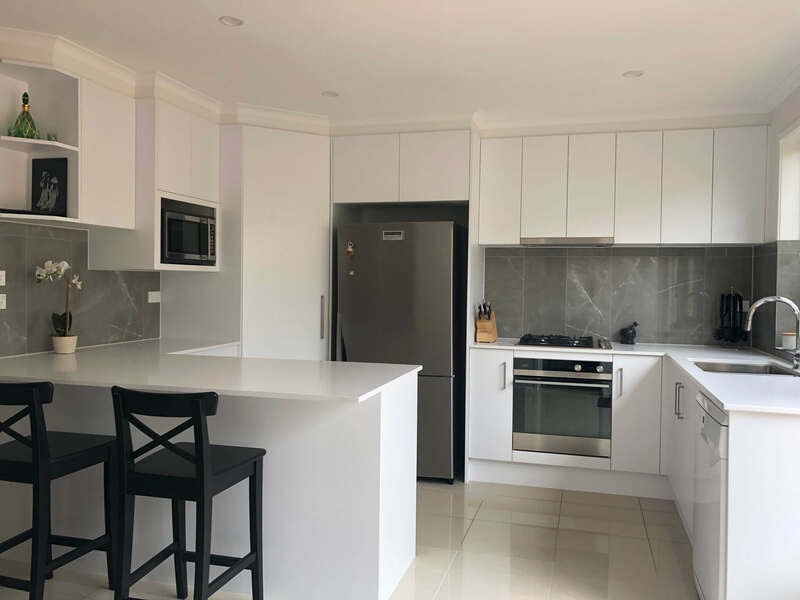 We have been renovating the Hills & Hornsby Districts beautiful for the past 24 years and can provide advice and expertise that only comes from years of experience. 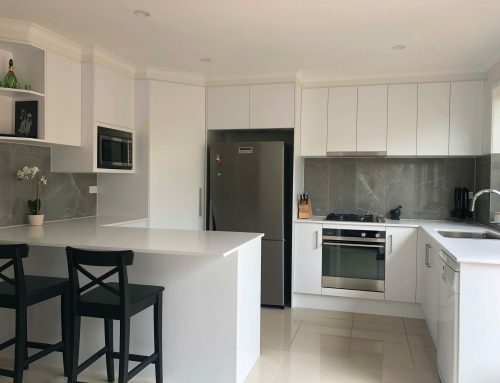 Be sure to peruse our website for more renovation inspiration and advice or simply call us on (02)9899-9330 for a quotation today.